A short education on color, infrared and ultraviolet light. Color can be defined by particular wavelength(s) of light. A pure color will have one particular wavelength such as 450nm will appear as a vibrant blue. The nm stands for nanometer and is a measure of length. One nanometer is a billionth of a meter. The measurement is for one full light wave length. 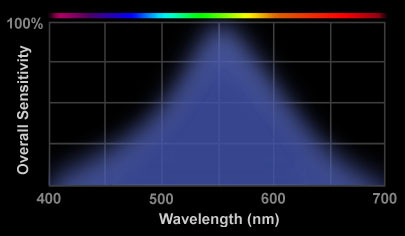 Humans can see from about 400nm (violet) to 750nm (red). Below 400nm is ultraviolet light. Above 750nm is infrared. The human eye is not equally sensitive to all colors. We see color best during the day when we are using the cone sensors in our retinas. Below is a graph showing how the cone eye sensors are more sensitive at some wavelengths than others. he eye is most sensitive in the green - yellow portion at around 550nm at night when it is using its rod sensors. So where does the human eye see relative to other wavelengths? Below is a graph showing the human range of the electromagnetic spectrum and where it fits relative to other bands. For astronomers, FIR may mean 300,000 microns for looking at very cold dust in galaxies while for a scientist studying room temperature heat, FIR is around 10 microns. Obviously, you need to make sure of your definition of terms when using infrared classifications. Your typical infrared enabled digital camera (e.g. Sony Camera with NiteShot), can see between 400nm and 1100nm. The non-human visible range between 750nm and 1100nm is called the Near IR (NIR) range. The NIR does not see heat. Heat is seen in the 8,000nm to 13,000nm range.